Hebrew stylist; born at Brody in the latter half of the eighteenth century and lived into the nineteenth. 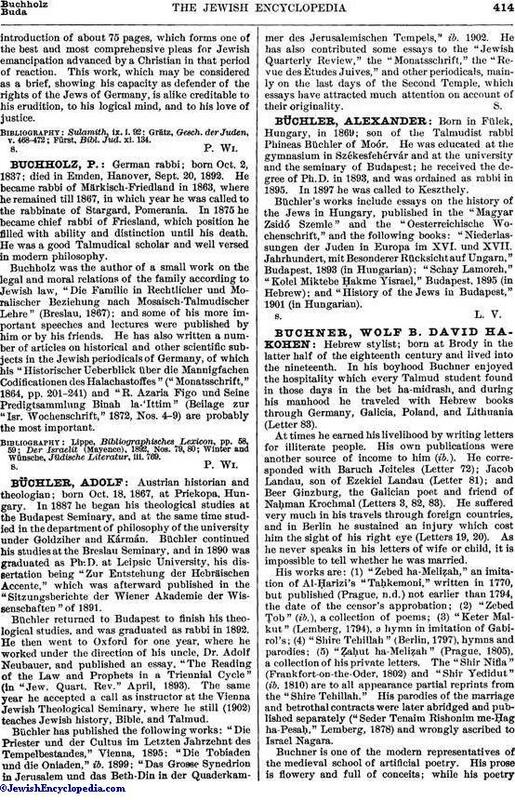 In his boyhood Buchner enjoyed the hospitality which every Talmud student found in those days in the bet ha-midrash, and during his manhood he traveled with Hebrew books through Germany, Galicia, Poland, and Lithuania (Letter 83). At times he earned his livelihood by writing letters for illiterate people. His own publications were another source of income to him (ib.). He corresponded with Baruch Jeiteles (Letter 72); Jacob Landau, son of Ezekiel Landau (Letter 81); and Beer Ginzburg, the Galician poet and friend of Naḥman Krochmal (Letters 3, 82, 83). He suffered very much in his travels through foreign countries, and in Berlin he sustained an injury which cost him the sight of his right eye (Letters 19, 20). As he never speaks in his letters of wife or child, it is impossible to tell whether he was married. His works are: (1) "Zebed ha-Meliẓah," an imitation of Al-Ḥarizi's " Taḥkemoni," written in 1770, but published (Prague, n.d.) not earlier than 1794, the date of the censor's approbation; (2) "Zebed Ṭob" (ib. ), a collection of poems; (3) "Keter Malkut" (Lemberg, 1794), a hymn in imitation of Gabirol's; (4) "Shire Tehillah" (Berlin, 1797), hymns and parodies; (5) "Ẓaḥut ha-Meliẓah" (Prague, 1805), a collection of his private letters. The "Shir Nifla" (Frankfort-on-the-Oder, 1802) and "Shir Yedidut" (ib. 1810) are to all appearance partial reprints from the "Shire Tehillah." 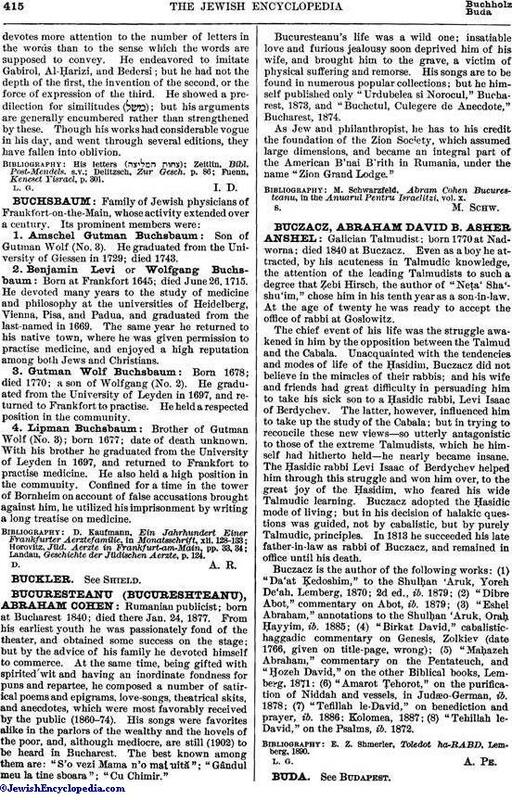 His parodies of the marriage and betrothal contracts were later abridged and published separately ("Seder Tenaim Rishonim me-Ḥag ha-Pesaḥ," Lemberg, 1878) and wrongly ascribed to Israel Nagara. Buchner is one of the modern representatives of the medieval school of artificial poetry. His prose is flowery and full of conceits; while his poetrydevotes more attention to the number of letters in the words than to the sense which the words are supposed to convey. He endeavored to imitate Gabirol, Al-Ḥarizi, and Bedersi; but he had not the depth of the first, the invention of the second, or the force of expression of the third. He showed a predilection for similitudes ( ); but his arguments are generally encumbered rather than strengthened by these. Though his works had considerable vogue in his day, and went through several editions, they have fallen into oblivion. Fuenn, Keneset Yisrael, p. 301.